K.S.P. Post 1 welcomes three new troopers. HICKORY, KY (June 25, 2018) – K.S.P. Post 1 welcomes three new troopers. 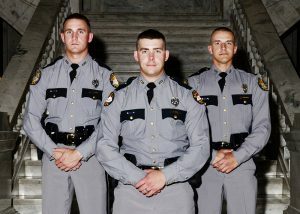 Trooper Nathan Moore from Ludlow, PA., Trooper John Holt, from Nebo, KY., and Trooper Tony Cornwell, from Paducah, KY., who were among the 42 troopers who graduated June 23rd from the KSP Academy in Frankfort. Trooper Holt received the Commissioner’s Commitment to Excellence Award, which is presented to cadets who demonstrate leadership, the desire to get the job done and the determination to be the best every day. 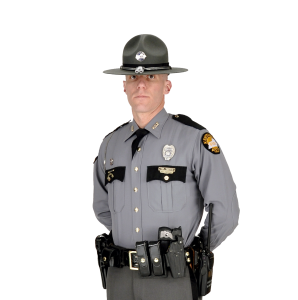 Trooper Cornwell was one of nine cadets who earned Associate’s Degrees in General Occupational and Technical Studies from the Bluegrass Community and Technical College during the training. The new troopers will spend eight weeks with a supervised field training officer before working their assigned county. Two troopers will be assigned to Post 1’s western squad, which includes the counties of Fulton, Hickman, Carlisle, Ballard, and Graves. One trooper will be assigned to the eastern squad which includes the counties of Livingston, Lyon, and Trigg.